For those of you just tuning in, here's how it works: I live in an apartment, but keep a garden at my parent's place. All of my intensive gardening has to take place on my balcony, since I only get to garden at my parent's place once every one or two weeks. Every now and then fellow gardeners have been incredibly generous with me, donating bromeliads, spiderlilies, cuttings and seeds, leading me to believe that gardeners are the kindest people on earth. 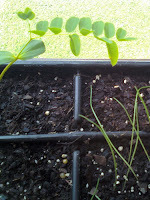 I start the seedlings and cuttings on my balcony until they're tough enough to brave "The Rainforest Garden" 30 minutes away, and hope to make my gardening friends proud by telling them I successfully grew them to maturity. 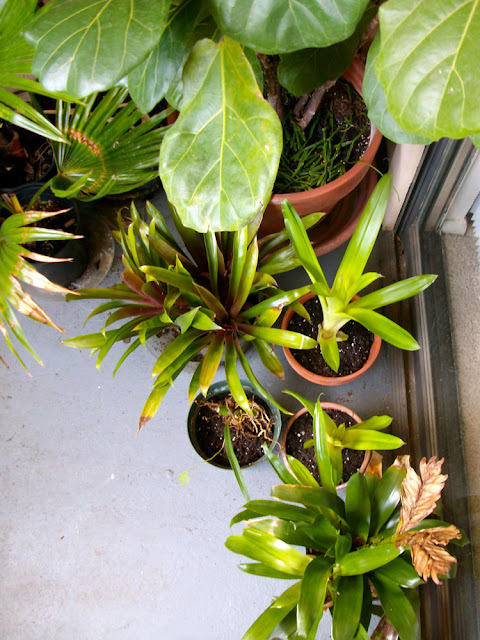 I also use my balcony to grow my more tender varieties of bromeliads and orchids, but hope to try them outdoors when I have enough divisions, when they have acclimated to our winters. For example, I have taken a whole bunch of rhipsalis cuttings and hope to try them in the garden , in a protected spot, of course. 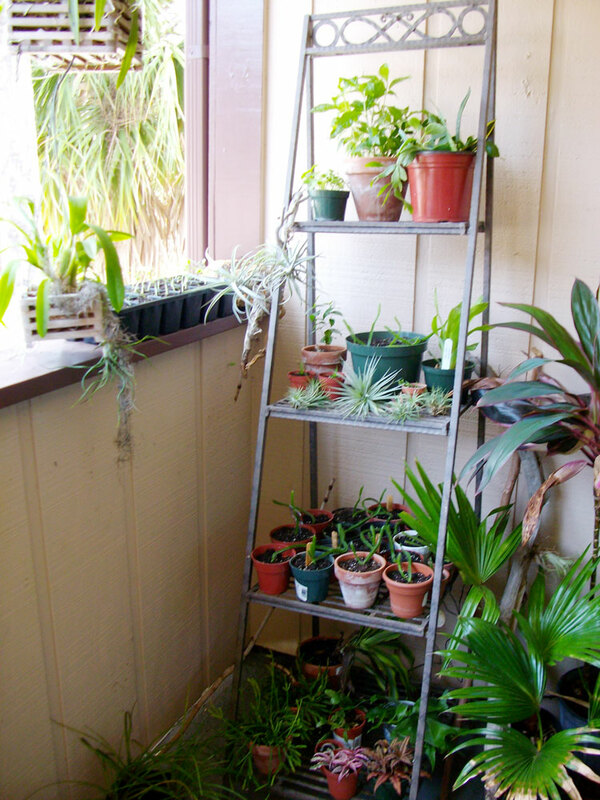 The other day I did a lot of dividing and cleaning up on the balcony, separating bromeliad clumps, repotting, and reorganizing my collection. I had a sad looking container of schefflera arboricola, dracaena and some bromeliads in the living room, and mercifully repotted them outside individually so I can give them the individual attention they need. I repotted my lady palm, and brought it back inside where the poorly planned container was. I also refurbished my epiphyte centerpiece! 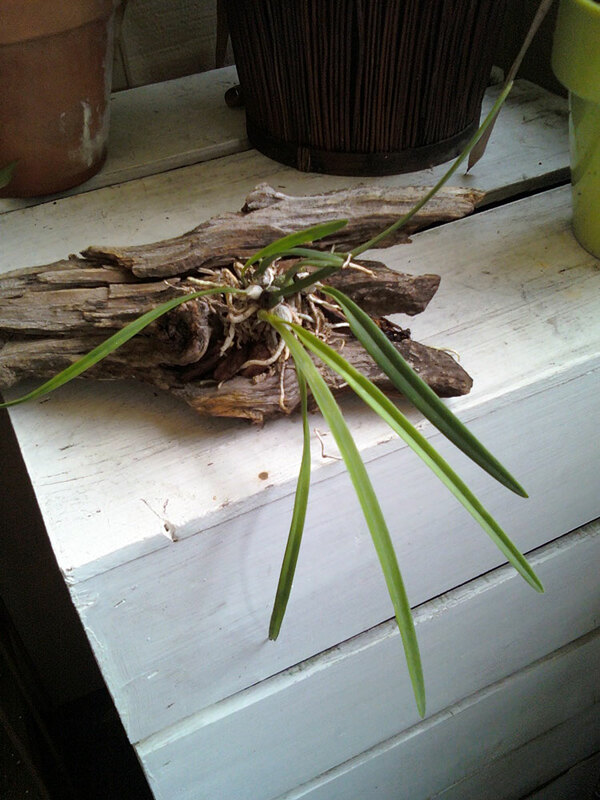 The vrieseas were getting a little too big, and my encyclia cordigera orchid was declining as a result. 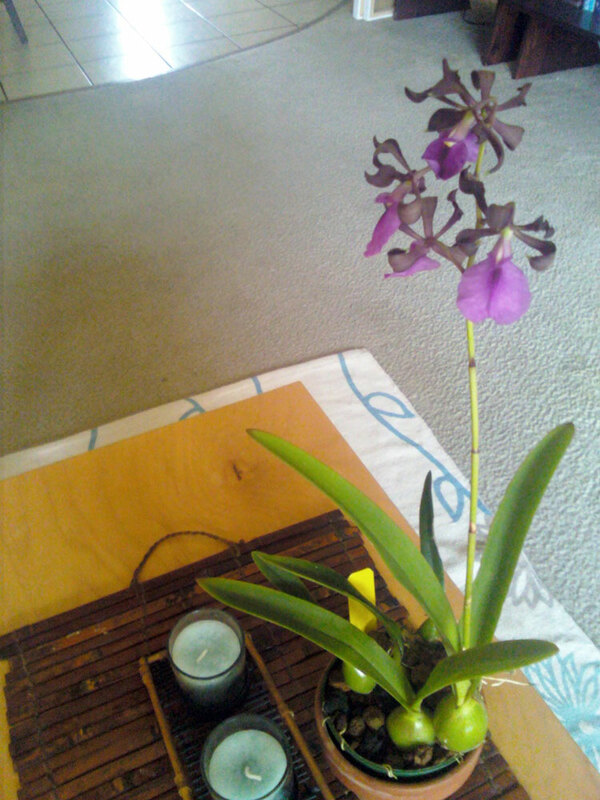 You can see in the photo to the left that it really used to be a happy orchid. Hopefully the increased light and circulation will go a long way in rejuvinating it. I also removed some shriveled "backbulbs" to remove some of the strain, and I hopefully I can even use the old pseudobulbs to create new orchids. I also added an encyclia tampensis to the centerpiece. It was doing great nestled in the crown of my japanese birds nest fern, but it can't really stay there, or else it will block the fern's emerging fronds! I also have a little colony started on a piece of driftwood. This native "butterfly orchid" has really been taking off with minimal care on my part, just an occasional drenching during my watering rounds. I plan on growing this one outdoors at some point, as they are native all the way to St. John's county in Florida... the same county that my garden's in! Rest assured that I'll give it a protected spot just in case. I've placed all of the vrieseas from the centerpiece in a pot for now until I get some more orchid bark, and the backbulbs of the encyclia are resting in a pot with a tipuana tipu seedling I acquired from the very generous Grower Jim of Garden Adventures. I really hope I can keep the seedling alive, since this is one of the hardier tropical flowering trees. 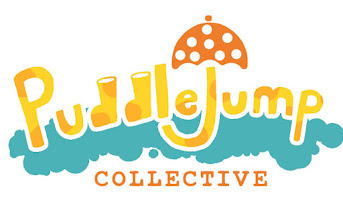 No documented success that I know of in Jacksonville, but when it grows up maybe I can slowly acclimate it. You can also see two of the pups from my huge alcantarea "inferno" against the window, which are already quite large considering they're just pups! I still have five more pups attached to the mother plant just in case the divisions don't work out. Here are pink rain lily seedlings and a pink shower cassia seedling from my friend Cora on Gardenweb, and hibiscus coccineus seedlings from "The Citrus Guy", all planted in a cellpack donated by my fiance's mom! 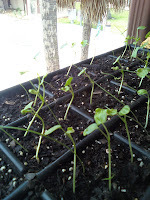 This tray of seedlings is the very embodiment of a "passalong plant", and I plan on sharing the surplus plants with other gardeners to complete the cycle. You'll notice that I planted the rain lily seedlings in the same cells as the swamp hibiscus, and this is so a drift of rain lily bulbs will automatically be created wherever the hibiscus is planted. Rain lily's grassy foliage easily blends into lawns, where they'll bloom right after rain showers, turning the lawn into a magical field of flowers for a while before returning to green. Here's a nice little assemblage of seedlings and tillandsias, which will be used in our wedding as centerpieces and boutonnieres. In the left hand corner, my Surinam cherry has gotten bigger, and the two itty bitty pots below it contain pineapple seedlings started from a fruit. The bromeliad to the right is my new Aechmea "Del Mar", which is too tender to plant in the ground. I know my limitations. 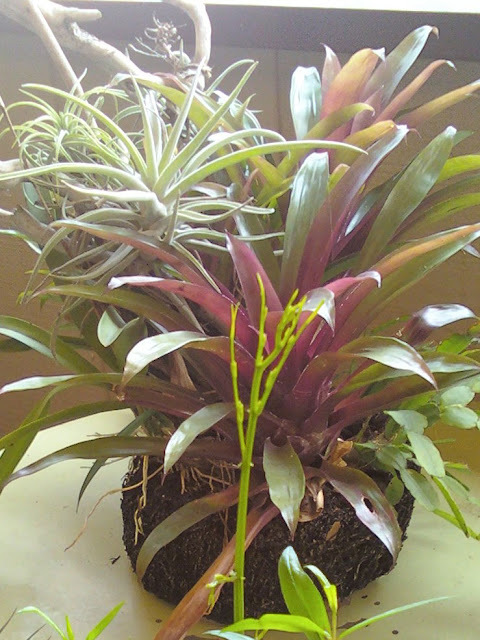 The big pot in the middle contains dragonfruit seedlings, also started from a fruit. The container was filled with them but I divided them a while back, into many individual pots, and giving some to coworkers. Here are some of those pots! 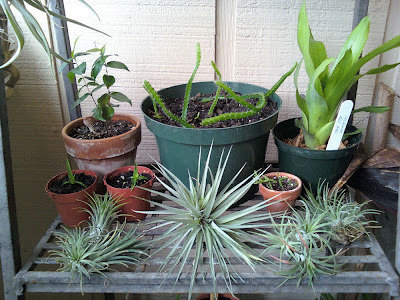 I now have 27 individual plants, which I can share as my own passalongs when the get older. It does look like they could use a bamboo stick in each one to serve as a trellis, though. Passalong plants are a great way to share the wealth and build friendships. 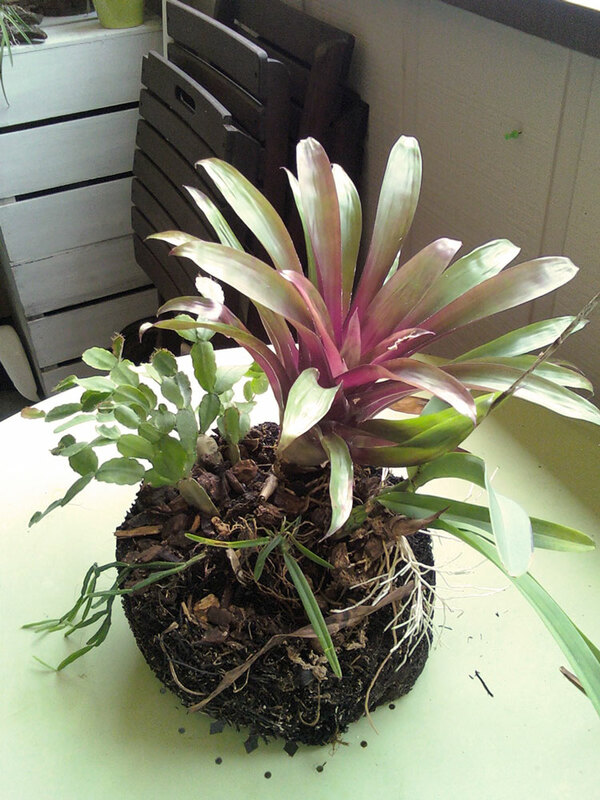 Its also a great way to see how your plant does in another environment, like when I sent Danger Garden some bromeliads and they responded to the cool summer by coloring up brighter than I've ever seen before! How rewarding! And I only hope to continue to do you proud by reporting on their growth and continued happiness soon! Your balcony looks so lush and "jungley"....it's the rain-forest garden annex! Isn't fun to have passalongs from friends, and you also give them to your friends? I have lots of passalongs from my friends, and coworkers. They sure gave my garden a jump start. Now I also have something to pass to my friends. That is just wonderful things in the gardening world. You are really making a very good use of your balcony! Glad that you also have your parents' garden to work on. Now that is cool. You have your fantastic balcony garden and your parents tropical garden as well. 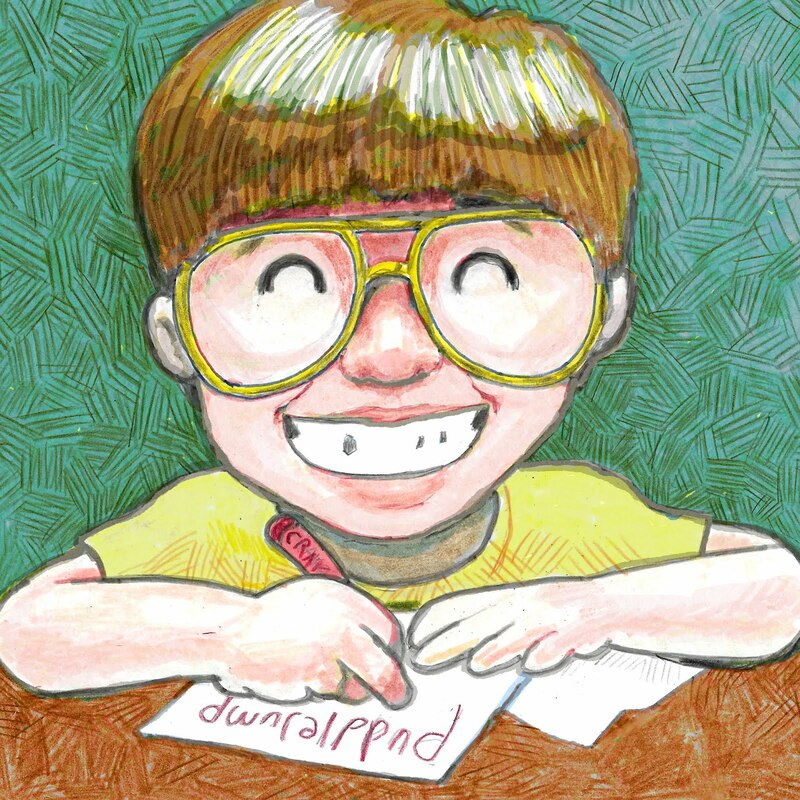 You are working in two different worlds learning what works well in each. I love all your little cuttings and plants hanging out on your balcony! They are always so fun to have about! 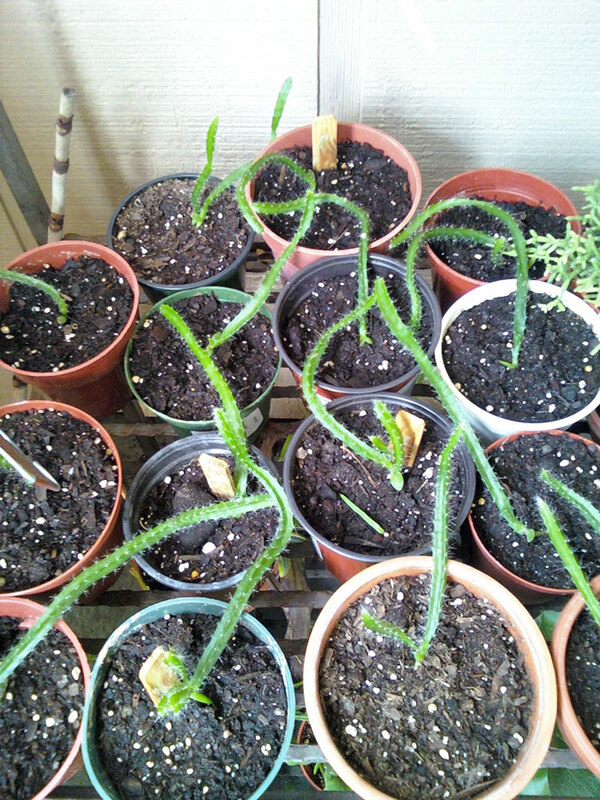 The last photo looks like something I might have...a huernia...am I right??? They all look so healthy, and you are a good caretaker, I am sure they will all adapt to your climate. Yes the dragonfruit definitely needs some support. here they grow about 10ft high - I wonder if that is a different type? anyway I would pass them along with a message to provide plenty of room! I think gardeners invented the word passalong! Your Balcony garden look so neat, mine is overgrown and messed up with cactus and succulents trailing all over. Just don't have the time or zeal to clean it up. Dragonfruit seedlings are just too much fun! The centre piece definitely looks better after. Have you ever grown ficus auriculata? It has huge leaves, is fast growing, and the fruit allegedly taste like strawberry. I tried some seeds but they never sprouted and was hoping to give it another go. They're not really hardy here but I'd bring them in for the winter. Well,its really nice to see that you have so many plants and lots of vases in your balcony...got so many views from you.. So tidy! Love your epiphytes. Hey, Steve! Wonderful to see your balcony garden. This is what I call the "nursery" at my house. I have similar shelves on my screened patio with my new starts, tender cuttings, etc. It's a big celebration when they graduate from the nursery to the great outdoors! I especially love your dragon fruit cacti. Honestly, I've never heard of starting them from seed...always used a cutting. Very cool, indeed! I'd love to participate in a plant swap, even though we don't live too close. Let me know if there's anything I have that you'd like to have. I'd love to trade for a rain lily or two! It's one of my goals to encrust a couple big indoor fig trees i have in epiphytes. I had a big mass of spanish moss that eventually all died (I suppose the air was too dry). Do you have any input on how I can keep spanish moss alive indoors or what other small epiphytes might do well in a relatively dry, not-too-bright apt? Or what I need to do to keep this stuff alive? You sure make good use of your balcony space. That's a really smart idea to use it for a little greenhouse/nursery for the larger outdoor garden. Love the tillandsias for the wedding. When? CONTRATULATIONS. 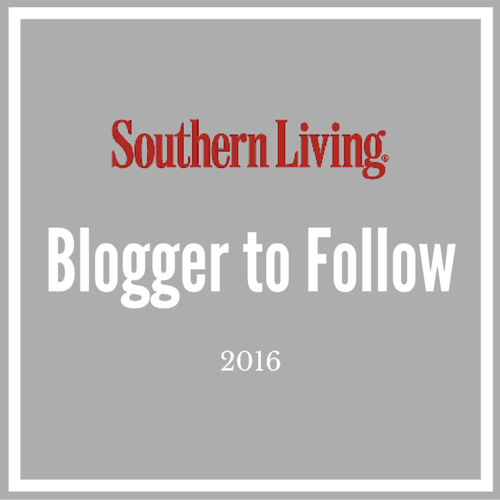 Not many blogs are fun to visit once the template is changed....Yours is one of the few that right away feels comfortable to the visitor. Thanks for your nice comment! I hope to plant the tipuana at the edge of the forest where it has some room and protection. Any idea if its tolerant of soil that might get soggy once every one or two years? Maybe I'll make a mound for it. The weddings on May 15th and I can't wait! She's been my best friend and my soulmate for years already. 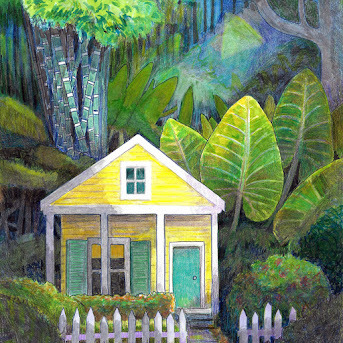 The Rainforest Garden Annex... I like that! Its so fun! Its also a great way to find common ground. Its really rewarding to grow things from scratch and see them grow up outdoors! Plus, my balcony is a great place to sit and eat breakfast, when its not too hot at least. The last photo is the dragonfruit seedlings! They will get much bigger in time, but for now my balcony is a decent nursery. Nope, just plain ol' dragonfruit! 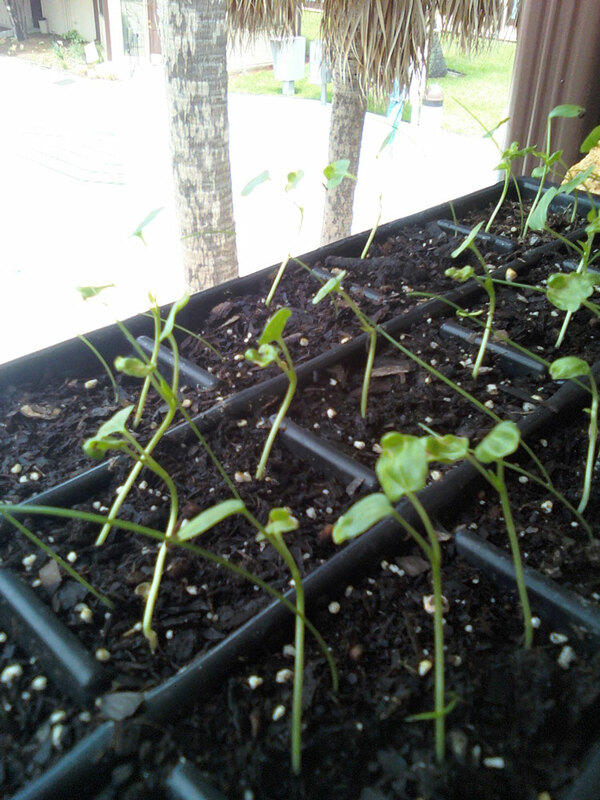 They're still just seedlings but eventually I'll start trading them, sharing, and planting in pots at my parent's. I'll have to see about getting some bamboo sticks or something to keep them trained! I haven't grown ficus auriculata yet, but it seems to be one of the hardier types from what I've read. I'll be keeping an eye out, since my ficus decora even made it through out 20F winter, coming back from the roots! Yeah, I guess I do have a lot of plants! Good ol' seeds! I spent a lot of time cleaning up recently... cleanliness is so important in container gardening! Thanks for visiting! You should see the dragonfruit fruits! They're neon pink with white flesh inside, peppered with little black seeds. A plant swap would be a lot of fun! We used to take a lot of trips down to the treasure coast for all the great nature and beaches, but money's been tight. Maybe when we make our way to the keys for our honeymoon! Of course I can always send you stuff too... If we wait a bit longer I can send you the rain lilies as bulbs! Email me if you want a dragonfruit or something! The spanish moss does best with light and humidity, but since they still thrive in the shady branches of oaks and even make it in arid California, anything's possible. People do grow it indoors, but be sure you thoroughly rinse it before you use it, since they do sometimes carry mites. The best way to keep it alive indoors is to mist it every now and then, and a humidifier would be great too... I'm sure the fig would like it too! Keep me posted on your progress: that sounds like a really great project! Its so fun to see things grow from a tiny speck to a big plant! BTW The weddings in may. Any recommendations for flowers in bloom then? That really means a lot to me! 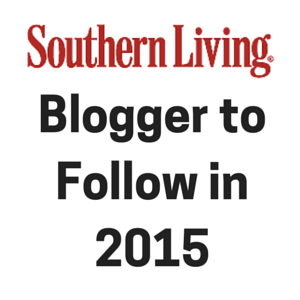 As a designer in training, the branding and simplicity of the blog are really important to me. I should be done with the changes for a while now... Thanks! Gardeners certainly are a generous lot. It looks like you're going to need a bigger balcony pretty soon. I love that epiphyte centerpiece...really nice job! Please do post pics of how you use the plants in your upcoming wedding.